Welcome back for part 2 of How to Make a Patchwork Table Runner! (If you missed part 1, click here to catch up.) I really hope I didn’t make part 1 too complicated because it’s not. Start sewing squares together to create rows, press the seams open, and then sew your rows together and press those seams open. Be consistent. Use 1/4″ seams. If I made part 1 seem complicated, please, let me know! We’re going to jump right in and show you two (technically, 3) different ways of binding your table runner. The first method is probably the easiest method, especially for a small project like this. The bigger your project, the trickier this method becomes. This first method is what I’ll call the “pillow method” for assembly. I call it this because you start assembling it almost exactly as you would for making a pillow (there are a few differences of course). *Note* I think I’ve explained what batting is before, but in case I didn’t, it’s a “fabric” that is made of cotton, wool, or polyester fibers that have been matted together to create a sheet. It’s not woven, and if you give it a good tug with your hands, it will come apart. Batting doesn’t have a right and wrong side to it. But getting back to the project. With this method, you will start by laying down the batting for your project on a smooth surface (a dining room table should provide plenty of space, just be sure it’s clean before beginning any sewing projects). I cut a chunk of batting off of some scraps I had from another larger project, and it was the perfect size for this table runner. Next, lay down your backing fabric so that it is face up on top of the batting (wrong side down). Smooth the fabric out so there are no buckles or tucks in the batting and fabric. The two pieces will probably cling together nicely. Finally, lay your patchwork top on top of the backing fabric, face down so that the right sides of the backing and batting are touching each other. Smooth the layers out again. Pin around the inside edge of the table runner border. Clip off excess fabric away from the patchwork top (you should be cutting the batting and backing only), leaving a little bit of excess around the perimeter of the patchwork top. You can see in the pictures below that my table runner top just barely fits within the width of my backing fabric. If I had ordered 1/2 yard to a yard of fabric instead, it wouldn’t have been such a tight squeeze. With all of the layers pinned together, you are ready to begin sewing. Make sure you leave an opening on around the outer edge… 6-8″ should be plenty. Remembering to leave a gap, sew 1/4″ seam allowance all of the way around the perimeter of the patchwork top, keeping your presser foot lined up with the edge of the patchwork, NOT the edge of the backing fabric or the batting. Just make sure you’re catching all three layers at once. I’ll say it again, as you are finishing up the edges, make sure you leave an opening! Why am I saying it again? Because it’s easy to forget, and then you have to go back and rip out seams. I’ve done it myself plenty of times before! Then go around the perimeter of the table runner, using the patchwork top as your cutting guide, trim away all excess batting and backing fabric. Once all of your seams are trimmed, reach your hand into the opening, grabbing between the patchwork top and the backing, and flip it right side out. Poke the corners so that they are nice and crisp. Tuck the raw edges of the opening in, and pin the seam shut. Hand stitch closed with a ladder stitch (making sure your thread blends well). Just like with the pillow project, you will want to roll the seams out to make them flat. This is a little trickier with a batting between layers as they will want to cling to each other more. Press the edges flat and smooth the whole thing out. Starting at one end of the runner, place the end underneath the presser foot, lining up with the seam of one of the rows of squares, quilting the layers together. Continue to this on both sides of every seam. When you’ve finished quilting the seams in one direction, quilt the seams in the same manner in the other direction. Trim all of your threads, and quilt 1/4″ from the perimeter of the quilt, turning at 1/4″ from the corner. Trim the remainder of the threads. Use the images below to gain a better understanding of the process and what your finished quilting pattern will look like. When quilting this top, make sure every seam follows the “forward, backward, forward” pattern of reverse stitching (at the beginning and end of every seam) to make sure that your quilting does not start unraveling on you. When quilting with this method, you can pin the quilt top to help ensure that things won’t slide around. Personally, I find that if I don’t pin with this kind of assembly, I actually have better results. If I start quilting at one end and work my way to the other, it pushes the fabric out to the edges where it should be, which is helpful because of the “pillow” assembly. Remember to be cautious of where you leave things like pins, needles, seam ripper, and scissors, especially if you have little ones around. When E is awake and I am sewing, everything stays out of reach, and the iron only gets plugged in while in use. For a more “traditional” binding, you’ll need to do your quilting first, and therefore, you will assemble the layers a little differently. With this type of assembly, we do our quilting first, then we finish the edges. Begin by laying down your backing first, right side facing down. (Make sure your fabric has been ironed to remove wrinkles.) On top of that, place your batting, and smooth out. Finally, place your top onto the stack, right side facing up, making sure that there is batting AND backing underneath the entire patchwork top. Smooth out, and pin into place. I use safety pins because you don’t get stuck with pins while quilting, but you can use stick pins if you do not have safety pins or enough safety pins. With your layers pinned together, cut the excess batting and backing away from your patchwork top, leaving somewhat of a border. You can get packages of safety pins in the craft aisle of most “general” stores, or by the notions (near the other pins) in the sewing department. If you are having a hard time locating different notions such as safety pins, ask a sales associate, and they should be able to help you. Never be afraid to ask questions. They may not always know the answers, but that’s what they’re there for! Now you can begin quilting in the same way that I showed for the other table runner. I actually like to start my quilting in the middle with this kind of assembly (not necessarily the center point of the quilt, but the median line that runs through in one direction or the other). Stitch lines 1/4″ from the seam between blocks, down both sides of the seam. I spin my work back and forth as I go so that I don’t have to constantly change the positioning of my needle. I also don’t clip any threads until the very end…. just like with assembling the patchwork top, not clipping threads at the end of every seam means that you are wasting less thread. But if you are finding that your work is becoming difficult without clipping the excess threads between maneuvers, then, by all means, clip away! This type of clipping does not require all of the “forward, backward, forward stitching since the binding you place next will hold it all in place for you. Once your quilting is completed in both directions, trim the excess batting and backing all around the perimeter of the table runner top. To make the binding of the table runner, you are going to want to cut strips of fabric that are 2 1/2″ wide on the BIAS of the fabric. If you remember from this post on sewing terms, the fabric has a grain and a cross-grain, which is the direction that the threads run, vertically and horizontally through your fabric. The bias of your fabric cuts through at a 45-degree angle across the fabric. Cut multiple strips of fabric from your binding material. You’ll need at least 110″ of fabric strips. (That should actually give you more than you need, but you want to have more than you need, as opposed to having too little!) To join the strips of fabric together, make sure that the fabric strip ends are cut at a 45-degree angle as well (this would have been perpendicular to the grain or cross-grain), and overlap the ends, right sides together so that there is a slight overhang of the tip end on either side of your “v” base. Stitch your seam together with 1/4″ seam, press open, and then fold the bias in half to create a tape that should be 1 1/4″ wide. The reason for cutting on the bias is that it gives the binding more give, making it easier to work around corners and curves. Joining the ends like illustrated in the image below helps to make sure you do not accumulate bulk on the binding. Take one of the tail ends of the binding, and start lining the binding up around the perimeter of the table runner. The binding should be on top of the patchwork part, with the raw edges of the binding lining up with the raw edges of the runner, and begin sewing with 1/4″ seam allowances (but leave the tail of the binding loose, by 1/2″ by the short end of the point. This is extra important at this point because if you do not use care, you will not be able to wrap your binding around to the other side of the table runner. Before you get to the corner, stop 1/4″ away from the raw edge of the runner, lift your needle. You need to lift the binding straight up to create a crease, and then fold it back down along the second edge. I’m having a hard time explaining it, and I had an even more difficult time getting good pictures, so I’m going to refer you over to Wendy’s Knitch where she has clear images of making the mitered corner. I use the same method, but she creates her binding differently than I do. As you are nearing the end of the binding, you’ll need to overlap the pieces. I fold over 1/4″ following the angle of the cut on the first tail end and tuck the second end inside. Make sure they lay flat, and stitch down the remainder of the way. When it is all stitched down, you’ll need to flip the binding away from the runner, and round it to the back side of the table runner. I only round a little back at a time, but you can use quilt binding clips or pins to keep it in place for you if you’d prefer. On the back side, you will then proceed to use a ladder stitch to sew the binding down. I ended up having to cut lengths of thread for the hand sewing 6 times, so don’t feel like you need to use one continuous piece of thread to do this… it will just lead to headaches and lots of tangles, and it will be impossible. Alternatively, you can do all of this binding stuff in the nearly the same way, but instead of hand sewing the binding down, you can “stitch in the ditch” on the top side of the table runner to catch the binding on the back side of the table runner. To do this, cut, assemble, and press your binding in the same way as described above, press it, sew it on, wrap it around to the back. On the front side of the table runner, you will stitch in the seam between the binding and the patchwork top, and you’ll have to be careful to catch the binding on the back side of the runner. There are other methods for binding quilts out there, but for now, I’ll only share these methods with you. I typically opt to do the second binding option, where you hand sew the binding down because I feel like you get a neater finished look in the end. In my experience, you are more likely to having puckering and tucks in your quilting with the first method, and binding with the second method is more consistent around the edges than it is to stitch in the ditch. But that’s just me, and you can choose whichever method seems easiest or most appropriate to you. As you can see in the picture below, the binding on the back side of this piece is uneven. (I was also using a navy bobbin thread which I didn’t realize until I finished sewing it together… oops… you’d typically want that to match your binding fabric as well as possible, so I should have used white thread. At least my mistake was good in that it illustrated a point! Whenever you have completed your table runner, there is one final option that you can use as a finishing touch on the back. It’s a label. 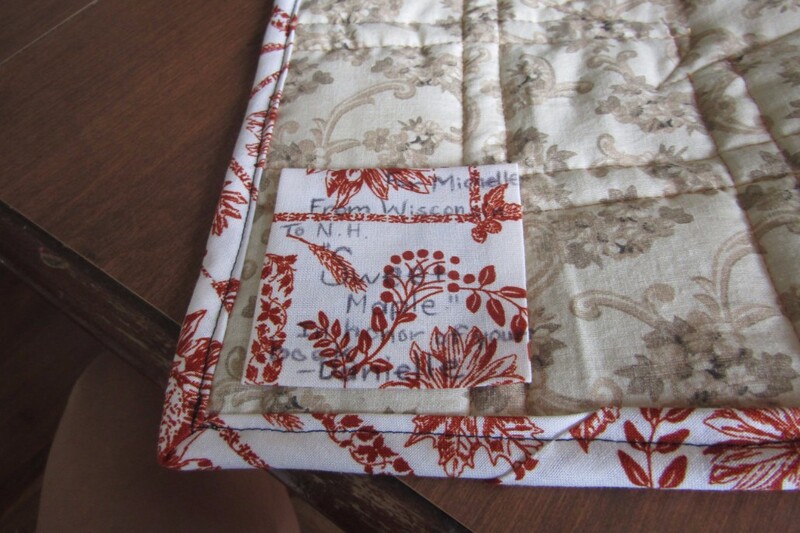 We label quilts with the date they were completed, the name of the quilt, and who it is made by. If it is a gift, then we may include who it’s gifted to. This is far from being a necessary step for a table runner, and in fact, that picture below is of a small wallhanging that I sent to a friend as a gift, and I did not include labels on either table runner that I made. The biggest reason for adding a label to your work is that it’s like signing a piece of artwork. These quilts can get passed down for generations if they are really well taken care of, and it is really neat to be able to see who made the quilt, when it was completed, if you don’t recognize the pattern of the quilt, the quilt pattern’s name, and potentially a reason for why it would have been made in the first place. There are special fabric pens and markers for this kind of thing that are not supposed to wear off (though sometimes they do). Before the special markers came around, women would have hand-embroidered those details on the label. To attach a label, you cut a square of fabric in whatever size seems appropriate for all of that information, plus a border of about 1/4″. You’ll press all of the edges under a 1/4″, and then attach the label by hand sewing it down with the ladder stitch. When it is all done, you have the option of pressing the whole thing to make sure it lies flat. I wouldn’t do that on most quilts, but for a small wall hanging or a table runner like this, it is good to get your work to lay nicely. Admire your handy-work! You just made a mini-quilt! As we said in the first part of this post, you can make your table runner wider or longer if you wish. There is no right or wrong on the size of this runner. All of the steps would be the same, but depending on the dimensions of your runner, you may need to piece your backing fabric together to achieve the right length. In that circumstance, you’d make sure your fabric is the correct width for the table runner, leaving a little extra for room around the edges, and then cut your extra backing fabric piece away, attach it to one of the ends on what is now the length of the table runner backing, and sew a seam to join the pieces, pressing the seam flat (and preferably, open). Then follow all of the above steps for your chosen method in the same way. And just as you could make this longer or wider for the sake of a table runner, you can make it longer and wider to make a quilt. If you haven’t made any quilts before, it’s really best to start small and work your way up in size if you can. That’s not to say you couldn’t just jump in and try a large quilt right off of the bat, but you’ll probably experience more frustration and difficulties if you aren’t familiar and comfortable with these skills on a small scale. How did your table runner turn out? Send us pictures! You should be able to contact us through our contact page or post pictures on our Facebook page. Let us know if you have any questions or comments. As always, feel free to pass these tutorials along. Sewing has become somewhat of a lost art, and we want to help bring it back as a common skill! Looking for more? Check out the links below for the rest of the series. You said in one of your posts that you are “hard on your machine.” What exactly do you mean by that? I don’t see anything in this post for example that looks as though you are pushing the machine to do more than it should. That’s a good question. And you are right, there is nothing in this project that is too rough for my machine, and should not be rough on any machine, really. 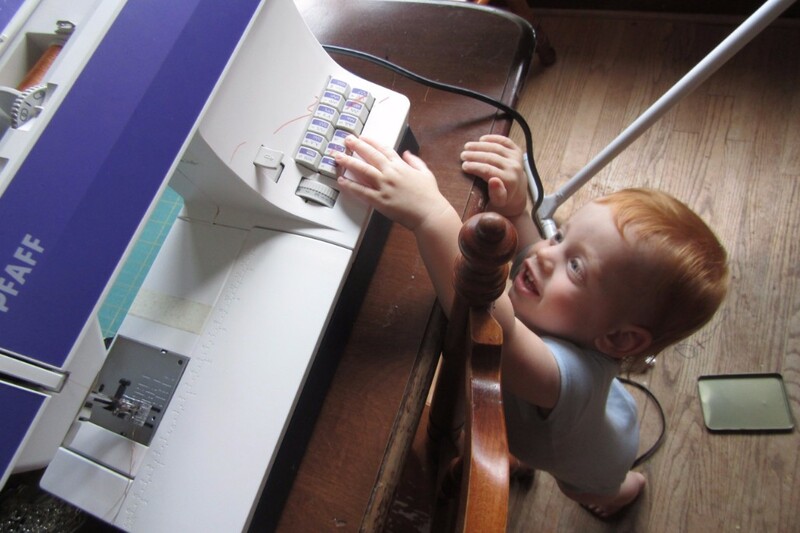 I do a lot of work on my machines that most people won’t ever attempt to work on. I’ve done a lot of heavy-duty repairs (heavy tents, leather jackets, thick work clothes, bulky zippers…). Most machines wouldn’t hold up to that kind of abuse. Sewing machines today are often not made entirely of metal as they used to be, which means they can wear out more easily, and it’s best to get a machine that can handle that kind of work. And having something computerized would be risky for me because the abuse I put on the machine during those types of projects. It would potentially damage the computer components of the machine.